My mother is one of the many Internet users over the age of 65. Like many older web users, until recently she had no real prior experience of using a web browser. My mother is also a classical music lover, and today she tried to look at the National Concert Hall website. 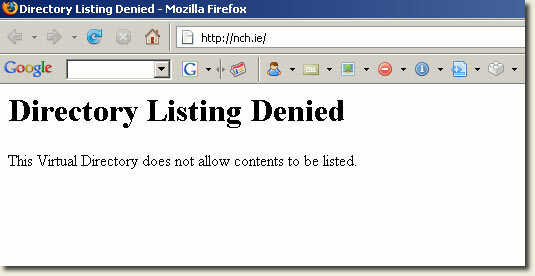 Surprisingly my mother knew that nch.ie was the web address of the National Concert Hall. It’s fair to assume that she discovered this offline, so the NCH has been branding the web property, and quite successfully so given my mother’s instant knowledge of their URL. This site has been constructed to be as accessible as possible to visitors of all abilities. It’s a really dumb mistake to make that can be easily rectified. The DNS is setup correctly at least! I believe it’s MediaOne managing that particular site. Slap on the wrist there. Thanks for pointing that out Pete.